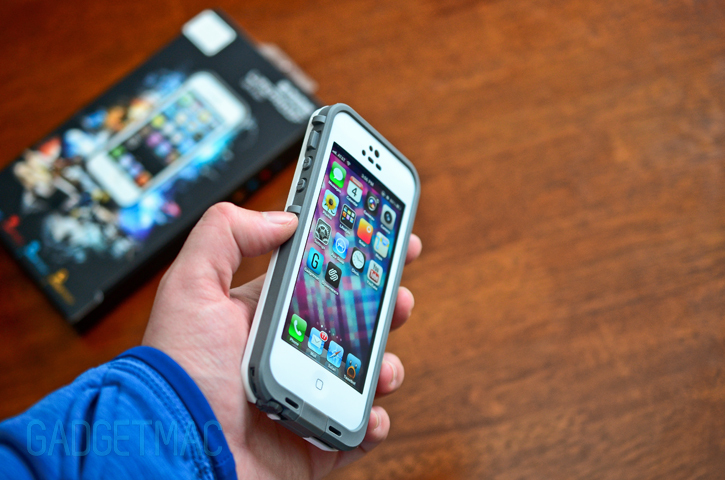 Over the years many companies have tried to make a fully waterproof and rugged iPhone case, but none of those cases were as good as the LifeProof case. The Fre for the iPhone 5 is of course identical in design and performance as its shorter equivalent, and it'll even set you back $80. 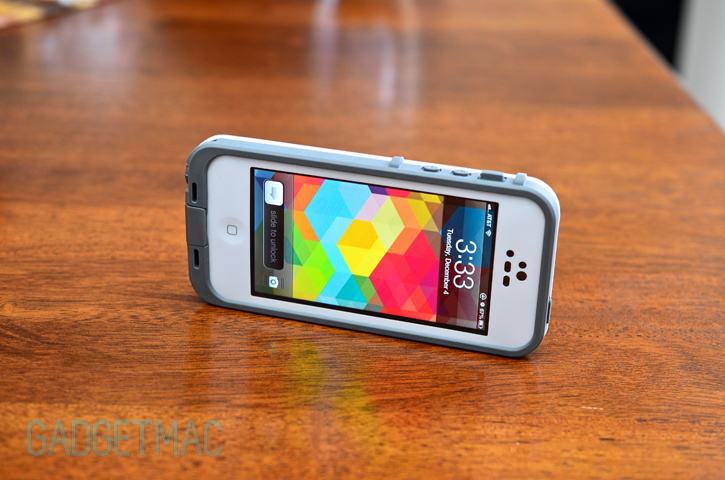 The Fre is the unseemingly submarine of iPhone cases. Looking at the Fre, one will never guess it is fully capable of being submerged under water to depths of up to 6.6ft (2 meters), for 30 consecutive minutes. If that doesn't impress you, which I'm sure it does, then the klutz in you would love to know that the Fre case meets military standards in surviving impacts, shock and even your real-life scenario, accidental drops of as high as 6.6ft (2 meters). With such an impressive case as your side, who even needs AppleCare+? Installation isn't any more difficult than snapping a Glad container shut. The Fre literally snaps together like a plastic container, only it is fitted with a rubber O-ring to insure a watertight closure. 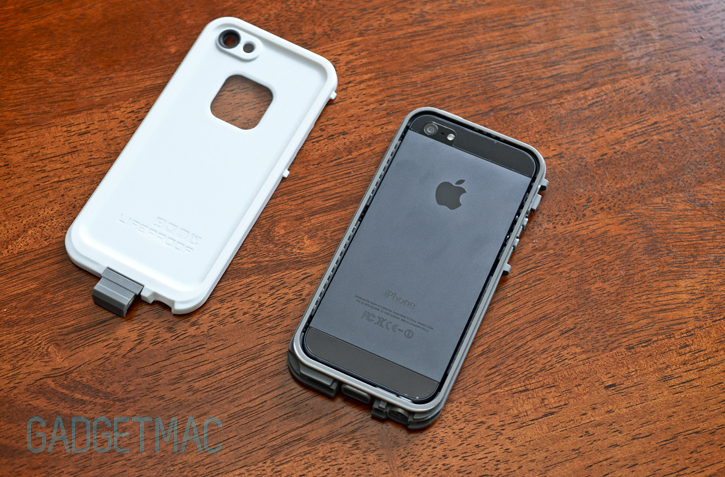 Otherwise, getting your iPhone 5 in and out of this case is painlessly simple. As long as you properly follow the steps correctly, you should never encounter a fearful water leak. LifeProof's Fre does come with some drawbacks that'll sure to get under your skin and might even prevent you from wanting to use it as an every-day case. 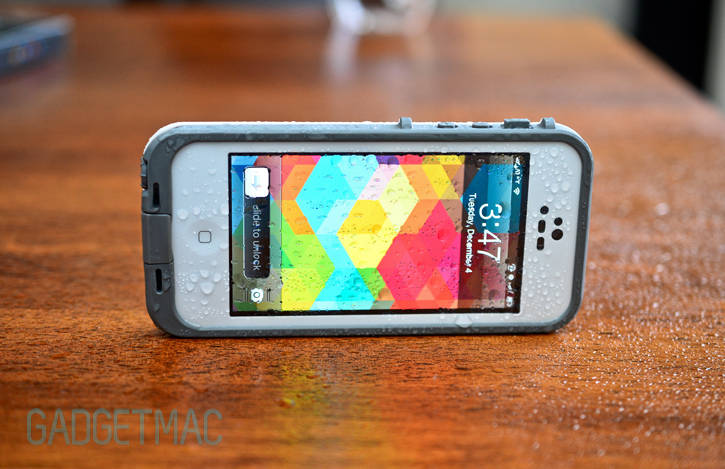 Just as we've pointed out when we reviewed LifeProof's iPhone 4/S cases, the iPhone 5 Fre's waterproof capabilities come at a cost. 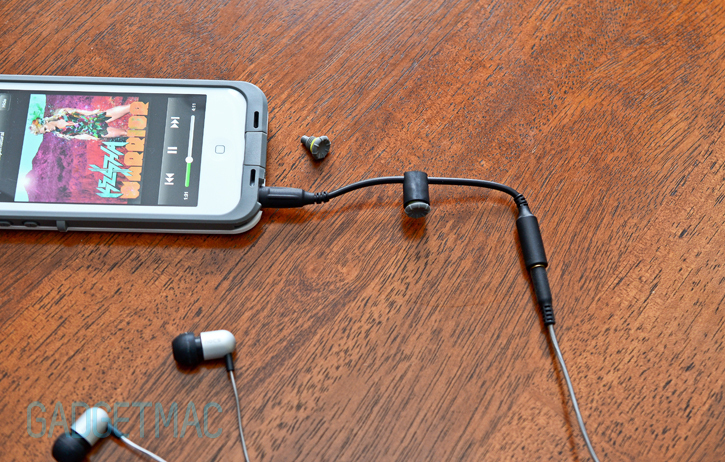 You'll need to unscrew a watertight plug in order to use the included screw-in 3.5mm headphone adapter each time you'll want to plug in a pair of headphones at the gym or wherever it may be. The iPhone's touchscreen responsiveness when using the Fre is typical of what you'd expect when using your iPhone under a plastic screen protector. 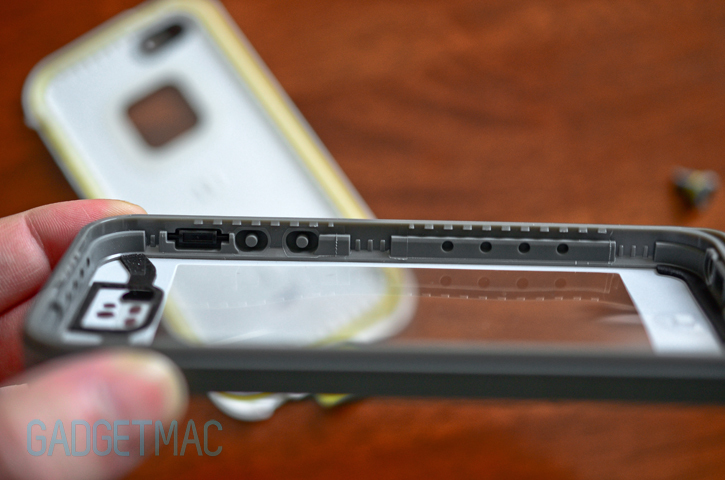 The Fre's built-it screen shield doesn't impede on the iPhone 5's Retina resolution and pixel sharpness, but it's thickness is definitely noticeable. What you will notice however, is that odd resistive-like touchscreen display experience you get caused by the Fre's hovering built-in shield. It's the same feeling you experience with all types of cases that use a build-in screen shield such as Otterbox and Griffin. In the Fre's case, the resistive feeling is more noticeable towards the ends of the display where the shield has more lift to it because of the interior support for the home button and the earpiece membranes. 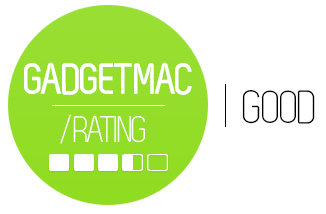 The edges require more of a pressing feedback from your finger rather than a simple touch. LifeProof failed to improve on speaker performance. The special membrane-protected ports made for the iPhone 5's speaker aren't working as they should and instead of your speaker audio firing front side, you'll notice that the audio will vibrate its way thru the back side of the Fre's rather thin plastic back panel. This causes a noticeable audio degradation in both quality and volume sadly. And all of this despite LifeProof claiming it has greatly improved and re-engineered the Fre's speaker ports to deliver maximum audio clarity and volume output. With that said, it isn't the end of the world by all means. You'll still be able to hear the speaker audio fine, but using your iPhone on speakerphone might not be ideal. Forget about using your charging dock, because with such a deep Lightning port hole, you'll just have to resort to using the Apple Lightning cable instead. Again, it's a small price to pay when you're getting waterproofing. The Fre's built-in screen shield is faced with the task of covering a taller display this time around, and that is proving to be somewhat difficult. LifeProof made some significant changes with the Fre compared to past models of the iPhone 4/S in adding strips of support around the earpiece area in order to help reduce issues with the screen shield creating watermarks on top of the iPhone 5's 4-inch display. This however, did not really help. The Fre's built-in screen shield does suffer from some watermarking or better described as rainbowy oil streaks, occurring around the middle part of the display as well as the aforementioned significant "pillowing" effect around the top and bottom portions of the Fre. The good news is that these watermarks will hardly be noticeable to you while the screen is turned on. 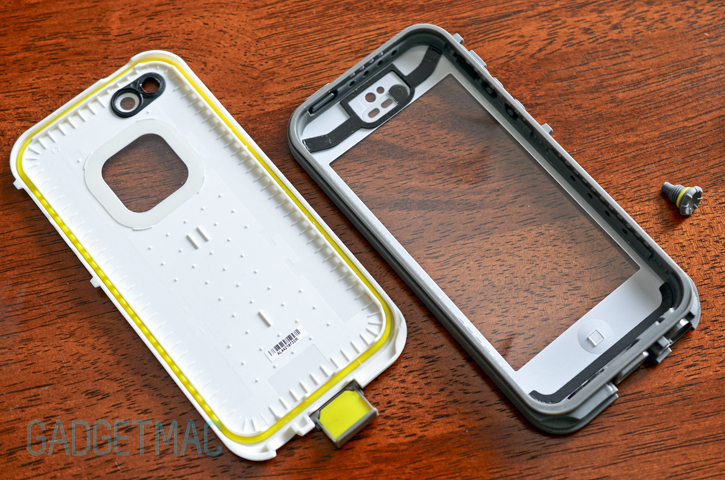 LifeProof is apparently actively trying to improve the Fre and there have already been a few new improvements and case generations that were quietly released, and we think this particualr review unit isn't one of them. 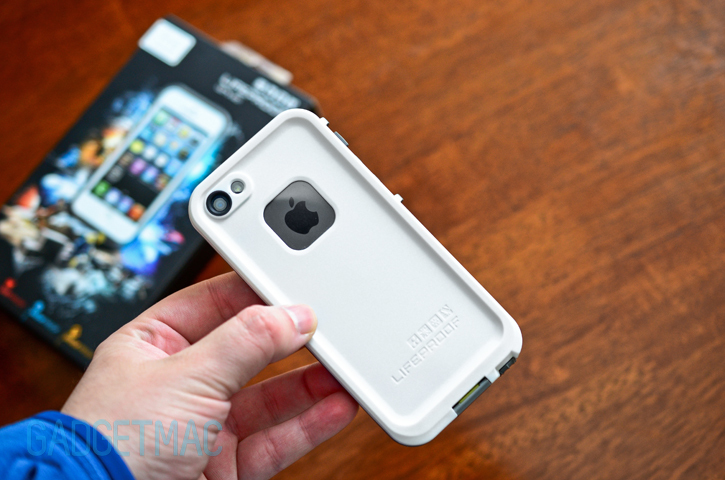 Chances are that if you order a new Fre case directly from LifeProof, you'll be sorted out with the latest little improvements. 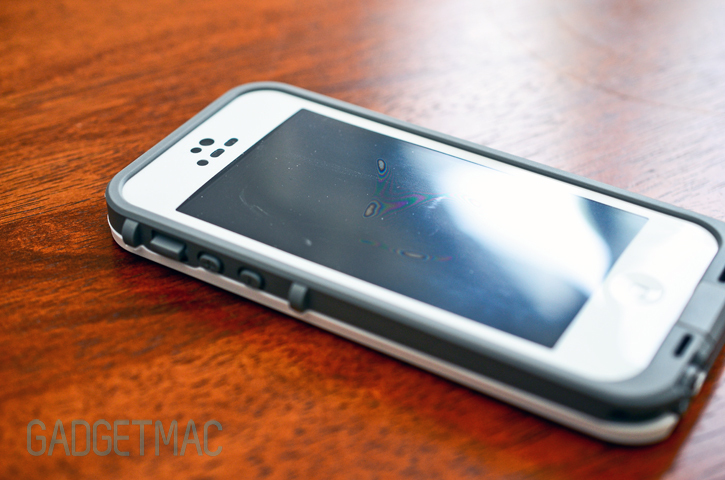 LifeProof's Fre is not perfect. 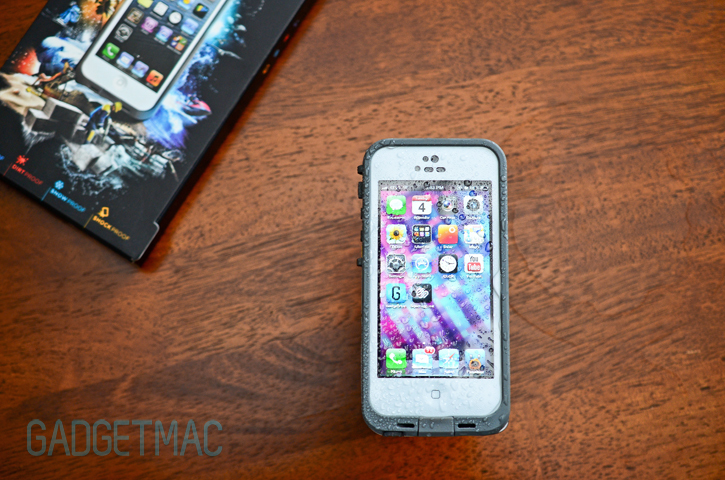 What it is though, is the best rugged waterproof case currently available for the iPhone 5 and the name does suit it quite well. The Fre keeps its cool at bay while underneath it packs a bevy of performance protective aspects in a slim, well designed package - albeit at a cost. The greatest achievement the Fre has going for it, is its streamlined design that's less bulky than a rain and drop-protective Survivor or Otterbox case, yet offers twice the protection. However, There are those drawbacks and quirks you should seriously take into account before you hand over your $80. 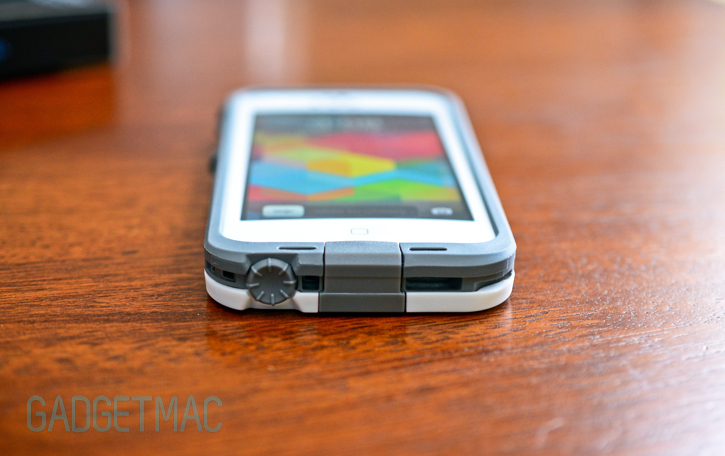 Getting used to the built-in screen shield, the Fre's unimpressive speaker performance, cumbersome headphone adapter and the incompatibility with charging docks are the sort of knocks we have against LifeProof's iPhone 5 case this time around. 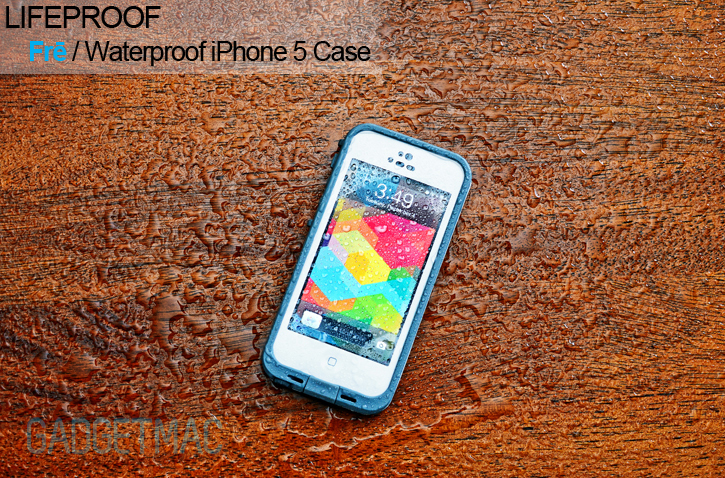 With that in mind, we still think the Fre is worth trying out if waterproofing your iPhone 5 for extreme occasions is at the top of your list. If you can bring yourself into sacrificing some of the iPhone's luxuries in exchange for the Fre's outstanding proficient abilities, there is no better case that'll do the job.